Merging with the iconic Hong Kong skyline, InterContinental Grand Stanford is located along the waterfront of Victoria Harbour. 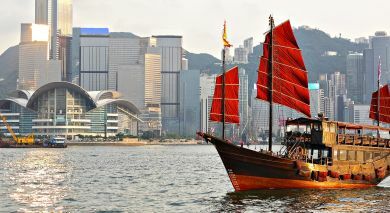 With stunning views of Kowloon Bay and Hong Kong Island, the tastefully done up rooms have WiFi, TVs and iPod docks. Treat yourself to a range of fine culinary experiences at any of the hotel’s restaurants. Savor authentic Italian dishes at Mistral, while Hoi King Heen impresses with their Cantonese classics. To sample some of the finest whiskeys, head to Tiffany’s New York Bar. The hotel, a 35-minute drive from the airport, is in close proximity to the famous Star Ferry.